On this feast of Mary we celebrate a special favour that God gave to Mary, our Mother. The Assumption means that Mary was taken up into the glory of heaven not only with her soul, but also with her body. Jesus, the Son of God was born from Mary's pure womb. So when Mary died, God the Father and Jesus, would not let the body of the Mother of God be spoilt. This was her reward for her love of God and her years of faithful prayers and suffering. Now Mary is in heaven. 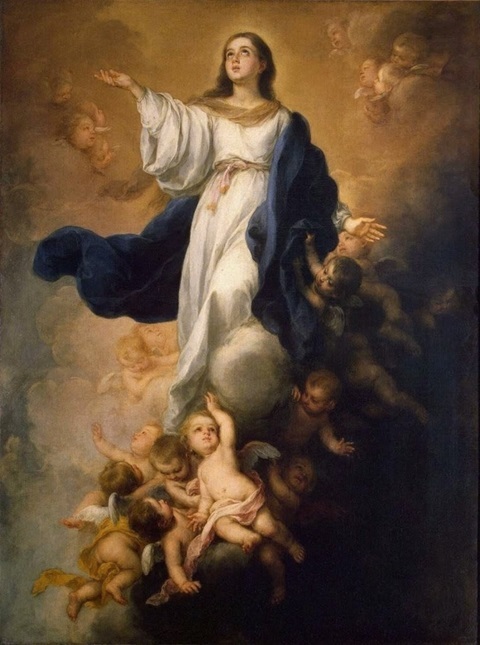 She is queen of heaven and earth. She is the Mother of Jesus' Church and queen of apostles. Every time Mary asks Jesus to give us graces, he listens to her request. After the resurrection from the dead, we, too, can go to heaven with our bodies. Our bodies will be perfect. They will not suffer illness anymore. They will not need any more food and drink to keep alive. They will be beautiful and splendid! If we use our bodies now to do good, those bodies will share in our heavenly reward. As we celebrate the feast day of Mary, we can ask our Blessed Mother Mary to guide, protect and care for us.